BC Premier John Horgan visits HMSHost workers at YVR! Local 40’s airport members made history this month! For the first time ever, the sitting BC Premier met with HMS Host workers at YVR on Thursday, June 14. Premier John Horgan heard compelling stories from our members who discussed how YVR Airport squeezes contracted workers by keeping wages low, flipping contractors, and discouraging union organizing. We told the Premier we need YVR to commit to a $15 airport minimum wage policy now, a worker retention policy for all YVR workers, and respect for workers’ rights to form a union at YVR. For nearly an hour, our members swapped stories with the Premier about the challenges of living in Vancouver on low wages, juggling multiple jobs, and their concerns for their future. The Premier discussed how the Province is tackling the challenge of affordability in BC and other efforts underway to make life better for British Columbians. We look forward to working with Premier Horgan and other leaders in our community to press for change and a better future at YVR! http://www.uniteherelocal40.org/wp-content/uploads/local40logo-300x155.png 0 0 Michelle Travis http://www.uniteherelocal40.org/wp-content/uploads/local40logo-300x155.png Michelle Travis2018-06-23 13:35:112018-06-26 16:03:22BC Premier John Horgan visits HMSHost workers at YVR! Our city is becoming more and more unaffordable by the day. We need a $15 minimum wage! The new provincial government has launched the Fair Wages Commission to hear directly from us at public consultations throughout BC. 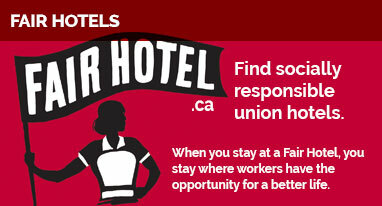 This Thursday, the Commission will be coming to Vancouver and Local 40 members will be there! YVR airport members from HMS Host will tell the panel how urgently we need to raise the minimum wage to $15 an hour so that more working people can make ends meet and support their families. We want the public to know that there is no place for minimum wage jobs at YVR or any workplace in BC. The price of housing, gas, food and other necessities keeps going up, but starting wages are too low to keep pace. Join us this Thursday to support your co-workers from HMSHost! Send a note to [email protected] and let us know you’ll be there. We want to send a strong message to the provincial government that the time to increase the minimum wage to $15 is now! Imagine if a business could set its own property tax rate, develop land without having to obtain local approvals and could operate without having to answer to our elected officials. Would we want a business like this in our community? Well, look no further than our own Vancouver Airport Authority (YVR). Some years back, the federal government partially privatized operations of major Canadian airports, including YVR and Victoria International Airport. The government granted airport authorities with many powers but little oversight and accountability over how they operate. Today, the federal government is reviewing whether to fully privatize airports. YVR says this would threaten local control and community input. Yet, YVR doesn’t listen to our community now! YVR can self-assess the taxes they pay to the City of Richmond, raise airport user fees at will, carry out land development projects without local approvals, and turn a deaf ear to workers’ concerns. If airport authorities aren’t accountable to our elected officials, how accountable are they going be to low-wage airport workers? UNITE HERE Canada presents at House Finance Committee’s pre-budget consultation in Vancouver. We think it is time to change the way airport authorities work with our communities. We don’t want privatization and we don’t want the status quo. In October, UNITE HERE Canada appeared before the House of Commons Standing Committee on Finance to call for federal reform of airport governance and made several recommendations to make airport authorities more accountable to workers and to our cities. We want real accountability from YVR and other major airport authorities so that they contribute their fair share, coordinate with our local municipalities, and engage meaningfully with airport workers. Is YVR Airport Sustainable for Workers? YVR is ranked the #1 airport in North America. Yet, too many airport concession workers juggle two jobs to make ends meet and work in challenging conditions. Worse, YVR can upend hard-won wage and benefit gains made by unionized concession workers when flipping contracts to non-union operators. “I’m exhausted all the time because I have to work two jobs. If I could have one job with a decent wage, I could contribute to my community, do some volunteering in Richmond. I can’t do that because I’m running from one job to another to pay the bills,” says Fipe Wong, a cook employed by HMSHost. YVR outsources food and retail concessions to several operators – including HMSHost, which operates Canucks Bar & Grill, Starbucks, Palomino’s, Tim Hortons, and other franchises – and keeps a portion of the revenues. YVR brings in more concession revenues, per passenger, than any other airport in North America, yet concession workers are being squeezed to work harder for less. Unionized concession workers at HMSHost are fighting back. The company wants to create more part-time, insecure jobs and wants workers to be on call seven days a week, yet still consider them “part-time”. Host also wants to make it harder for workers to have health insurance. Workers are in bargaining for higher pay, better access to medical benefits, and full-time work for those who want to maximize their hours. Workers are also asking Vancouver Airport Authority to step up and do what other major airport authorities across North America have done – adopt wage and worker retention policies to mitigate the impact of contract flipping on displaced workers. Together, concession workers are paving the way for decent jobs at the nation’s second largest airport. http://www.uniteherelocal40.org/wp-content/uploads/local40logo-300x155.png 0 0 Michelle Travis http://www.uniteherelocal40.org/wp-content/uploads/local40logo-300x155.png Michelle Travis2017-11-02 13:54:262017-11-03 11:07:52Is YVR Airport Sustainable for Workers?